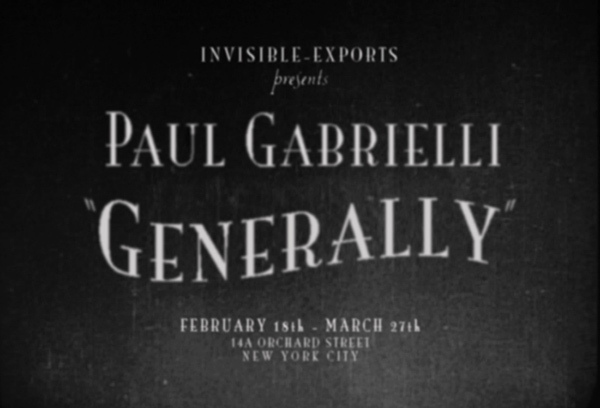 INVISIBLE-EXPORTS is pleased to present Generally, the second solo exhibition of work by Paul Gabrielli. Paul Gabrielli is an exacting deconstructionist sculptor, whose magical-realist assemblage work comprises a subversive program of building objects up as a way of taking them apart. In his earlier work, inspired by both the collage appropriation of Dada and the rigorous clarity of sculptural minimalism, Gabrielli transformed the everyday into the uncanny, producing ideal sculptures, both familiar and more perfect than their real-world counterparts. In this new series, Gabrielli continues to focus on ideal objects as abstractions, but has moved one level further into internal space, yielding a body of sculpture that interrogates perception and our broken ways of seeing. The new work is assembled not only from refined ready-mades but also from ambiguous trompe l’oeil elements shadowed by imposed obfuscations and everyday items turned on by unusual desires. The work included in Generally explores his vision of three-dimensional objects as compressed images. These intimate and meticulous sculptures mirror in the external world the way those same objects are processed through the eye and projected into the brain. In this way, Gabrielli transforms the gallery into an experimental environment at once fictional and clinical. By juxtaposing two objects of similar purpose — a re-imagined smoke alarm and an inscrutable fire bell, or a surveillance camera and a flashlight — he invokes a wayward world that touches on the romantic and the surreal, inviting us to abandon our real-world associations and approach those varieties of items instead as true objects. That is, objects of desire. The shape of infatuation, and its shaping power, feature especially prominently in Gabrielli’s “toys”—refurbished elemental items, such as wood, metal, or cloth, showcased behind plastic windows and mounted on cardboard backings of various landscapes, as though for display on a sales rack. In these enigmatic works, mesmerizing fetish tableaux in miniature, Gabrielli illustrates the lonesome manner by which we call objects to life through desire, enlisting them in our emotional lives through a dysfunctional imaginative campaign. In his work with institutional items, Gabrielli enacts that same desire, blurring the features of familiar structures as though by intense focus, close at hand but yet more alien. When we stare hard at objects, our desire is so strong that we lose sight of them. Paul Gabrielli (b. 1982) is a New York-based artist whose work has been exhibited at institutions and galleries including the Cartier Foundation, Paris; BOMB Magazine, New York; 303 Gallery, New York; and the Verge Gallery, Sacramento, among others. His work is included in the permanent collection of the Cartier Foundation. He has an upcoming profile in Mousse Magazine.